Jeanette Komatsubara of Mililani peers into her collection of more than 50 eggs she has handcrafted over the course of five years. Mililani resident Jeanette Komatsubara carefully decorates eggs with intricate patterns like an artist. She is as delicate with her words as she is with her craft. For example, point out the 50 to 60 decorated eggs displayed in the glass cabinet in her living room, and she replies: "I never think to count them. It's an elegant art. That's the reason why I'm into it." One of her more intricate pieces is displayed at the White House Visitor Center as part of the egg art display for Easter started in 1994 by first lady Hillary Clinton. Clinton had asked the American Egg Board to create an egg display for the White House, according to Lin Jackowski of the egg board. An artist from each state decorates an egg depicting their state. "It has been a tradition since then," Jackowski said. The eggs will be displayed on Plexiglas columns at the White House until April 4. Thereafter, the eggs will be packed and sent to the National Archives. 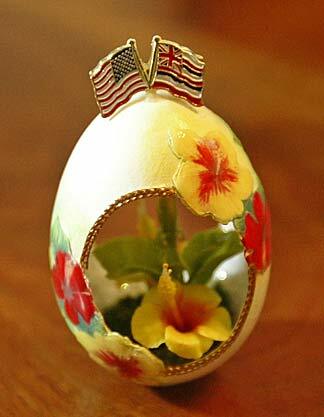 One of two eggs made by Komatsubara that she sent to the White House for its annual Easter display. Each crafted egg in the display is posted on the White House Web site at www.whitehouse.gov. Komatsubara, a retired computer programmer for the commander in charge of the Pacific command, said she became involved in egg decoration more than five years ago after visiting a craft store in Aiea, where classes were held. "Then it became a hobby for me," she said. 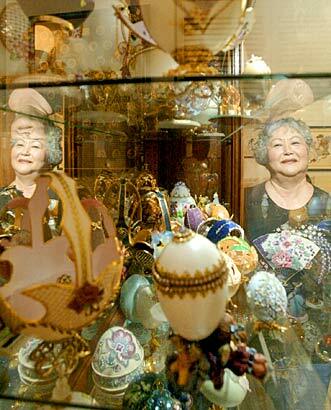 She also took a few classes from Eileen Tokita, who is known as the "egg lady" for her jeweled egg collections. Some of Komatsubara's crafted eggs were displayed at Washington Place for Gov. Linda Lingle's first Easter of her term. Over the years she has designed various types of eggs, from tiny finch eggs that measure about half an inch in length to large ostrich eggs that measure about 9 inches in length. Most egg artists emulate their craft from Faberge eggs. And like many of them, Komatsubara orders hers from the mainland, already drained of their insides. The egg representing Hawaii in the display is a chicken egg with miniature American and state flags on top of it. Small red and yellow hibiscus that Komatsubara cut out from decorated note pads adorn the exterior part of the egg. Komatsubara said she painted the egg white and sprayed a sealant around it to strengthen the fragile shell. With a dental drill, she cut out two ovals on the sides of the shell and decorated the egg cavity with a yellow clay hibiscus in the center and iridescent glitter in the inner wall. "You have to be very patient" when decorating eggs, she said. She created two identical eggs for the display just in case the one she mailed to the White House cracked.